Check this spread in Complex Magazine. The jist...they take a look at top players and their kicks, from the Iceman to LBJ (LeBron James). 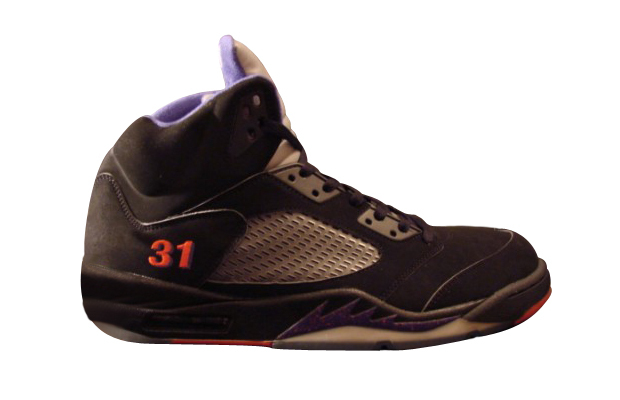 Number 50 on the list is Shawn Marion's 2005 Air Jordan V Retro's. The Matrix came into the league wearing AND1 and was soon after swept up by Jordan Brand. His days with JB saw more Team Jordans than retros, but at one time or another MJ and company sent him this nice Jordan V care package. Shawn kept these DS, never rocking them on court, but they do show the potential for Suns-inspired Jordans.